In the case of a client-based investigation, we need the interested party-individual, family or business to contact us and describe your questions, interests and requirements. If we feel that this is a situation in which we can offer help, we will set up a time and place to meet with you for a preliminary interview. This should be done at the investigative site. There is no charge for our services, however if the situation requires long distance travel, donations for those expenses are sincerely appreciated. At the interview, we will discuss what you have heard/seen/felt, etc., and get as much information as possible in order to properly structure the investigation. At this interview, we will be taking notes and making an audio recording and taking photos at the location. As much as possible, at this time we will map out the planned placement of our equipment. Then, we will schedule the site investigation and plan to arrive there early before dark to set up and test equipment. There are 5-6 Team Members and all will be participating. Usually, it is best for the owners/managers, etc., to be outside of the area of investigation once we start. You do not have to leave your home or business, but we do need to be able to move freely and concentrate amongst ourselves to achieve the best results. You are welcome to set any boundaries you like which you do not want entered or investigated and we will respect those unquestionably. We will also give your home/business/family/staff the utmost respect and we do not engage in any activities which would be at all likely to cause any damage to your property. The majority of investigations are conducted at night because this is when spirits/paranormal entities are most active. We will normally start up equipment at about 9PM and run for at least 6 hours or longer depending on the extent of the activity. Our equipment includes: digital still photos, videocameras and stand-alone audio recording, recorded EVP sessions with or without use of a Spirit Box, REM Pods, measurement and recording of temperature variants and EMF and other modalities. Our Team includes members who are intuitive/sensitive who greatly help to guide the investigation with their perception of Paranormal activity. We are not mediums, however and we do not use Ouija boards or other non-scientific methodology. Once the site investigation concludes we will pack up and leave your property in the same condition as when we arrived. Over the next several days we will analyze the audio/visual evidence collected and will provide you with a written report and CD copy of the evidence. With your written permission we request the opportunity to publish audio/visual evidence on our website or Facebook page, but we will not reveal any personal information, location, etc., unless you wish us to do so. Photo provided by client on one of our TX investigations. Team Member, Misty shot this picture on a whim with nothing visible to the eye and only seen when reviewing the digital image. 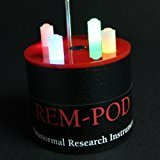 Add the Rem Pod to your PN arsenal and open a whole new dimension to your investigations. It sets up its own EMF and works by detecting disturbance to the field and signals with audible tones and flashing lights! EVP: Electronic Voice Phenomena-this is sound/words produced by paranormal entities and can be recorded in pure/unenhanced tones or with the aid of a Spirit Box. SPIRIT BOX: a radio receiver with AM/FM bands which is used in a sweep mode to provide a type of white noise in which there may be embedded fragments of words/names, etc. EMF: Electro Magnetic Fields can be measured and tracked across a location such as a room. The idea is that the EMF may be boosted without other explanation in the presence of a spirit entity.